Hi, and welcome to ActionDisplays.com. We are a full service Trade Show Display and exhibit company. We manufacture Trade Show Displays, Custom Tradeshow Display Tablecloths with Logo, Retractable Banner Stands, Table Top Displays, Exhibits, Banners, Signs, Posters and just about everything else you see on our site. We specialize in communication. With us you don't get an automated voice recording. 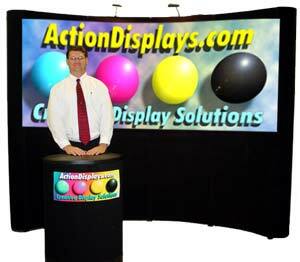 You get me, (Mike), live via a phone call... 1(717)379-4555 or email... Mike@ActionDisplays.com. There are others behind the scene too. Key "Grips" would be Bill, our "Ace-in-the-Hole" photographer, a.k.a. Mr. Photography. Bill shoots photography on a regular basis for magazines, ad agencies, marketing firms, a national drug store chain, (Rite-Aid) and for other companies that require high end photography. (1) Fifty four inch digital die cutting vinyl machine. (1) Large format cad plotter. (2) Large format, high resolution set cameras. (2) Large fifty four inch laminators. (3) Digital - High resolution cameras. (?) Several 35mm cameras, (that's Bill's dept?). (2) High resolution flat bed scanners. (1) Super high resolution drum scanner. (1) Dark room for photo developing. (1) Really big photo studio. (1) Really big finishing room. We look forward to hearing from you and working with you on your next trade show display. Even if you're not doing a trade show, and just need display advice, don't hesitate to email me with your questions. Mike@ActionDisplays.com. If you really have an urgent need, give me a call. 1(717) 379-4555. I look forward to speaking with you.